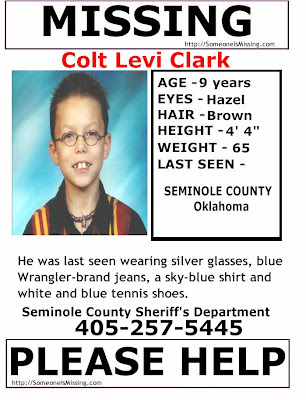 This is probably one of the most heart wrenching missing person stories I have read. I just happened to stumble upon it one day as I was googling missing persons. What happened to Jennifer? How can someone just disappear like this with no answers? Please take the time to visit her website. It doesn't take long at all. Below is information from the website about her disappearance. However, this is just one of the MANY information resources you will find at her site. ORLANDO, Fla. -- Orange County deputies found the car belonging to a missing 24-year-old Orlando woman at the Huntington on the Green apartments at Americana and Texas on Thursday morning. Sheriff deputies acted on vehicle information provided from the news media. Orlando police are leading the investigation into the disappearance of Jennifer Kesse who was last seen on Monday. Neither her family members nor friends have heard from her since then. Her family and police are hoping fliers with her picture will help track down the missing woman. Deputies found the 2004 black Chevy Malibu belonging to Jennifer Kesse on Thursday morning. Not knowing what has happened to Jennifer has been excruciating for the family and her friends. Wednesday, they were at the condo she moved into on her own just two months ago, hoping there will be some shred of evidence that will lead police to her. "She is daddy's girl, she's not afraid to talk to myself or my wife about anything," said Drew Kesse, Jennifer’s father. Jennifer is known to be extremely close to her family and friends. That's why they all now fear something is terribly wrong. "I didn't think I'd ever talk on TV about my daughter being missing," Kesse said. Police are calling her disappearance suspicious. Flyers with her picture are up all over the community in and around the Mosaic condos on Conroy Road, near the Mall at Millenia. Officers searched the thick brush just across from her condo. The last she was heard from was Monday night. She called her father after getting home from work. "That was it, just catching up, how ya doin'. We talk quite regularly. That was the last I spoke to her," he said. She had just come back from a trip to the Virgin Islands this past weekend with her boyfriend who lives in South Florida. She drove up Monday morning from Fort Lauderdale and went straight to work at the Central Florida Investments Timeshare Company in Ocoee. But, after speaking to her dad Monday night at her condo, she never showed up at work Tuesday morning and no one can get her on her cell phone. Recently, she shared concerns about living at the condos, though she was proud she could afford the place just two years after graduating from the University of Central Florida. "This was her pride and accomplishment, bought it by herself. She had some concerns with the maintenance crew," Kesse said. Her boyfriend, Robert Allen, agreed saying she was uncomfortable with the workers around. The buildings had just recently been converted to condos and only a handful of residents live in her unit. "Obviously, for me living three hours away, difficult hearing that with her saying I’m a little nervous here and there," Allen said. Along with Jennifer, her car was missing. The 2004, black, 4-door Chevy Malibu with plate number H-9-0 K-Y-C was found Thursday morning. 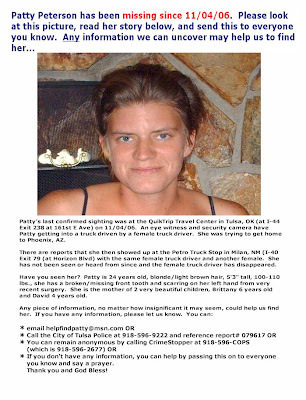 If you have any information about the woman's disappearance, call Crimeline at 1-800-423-TIPS. All day yesterday I was trying to think of something that I would like to write about. Then all of a sudden it was like a light bulb went on in my head. Ever have those moments? I have always been interested, almost obsessive, about missing children and adults. I have never had anyone close to me disappear, but it's a huge fear of mine that it might happen someday. Then when I read these stories out there of people whose loved one's just simply vanished one day, I would literrally be in tears. Can you imagine what it must feel like to not know what has happened to your child, friend or relative??? I'm sure many of you can. So then I began thinking what can I do to help? Not that I haven't had these thoughts before, but I just really never really knew what to do. Well I started a blog a few days ago about my family and parenting. So I thought what a great idea to add another blog about missing people! If even just one person looks at my page it might make a difference. They might recognize or know information about this missing person. So here I am trying to make a difference. Trying to make sure that these adults and children are never forgotten.